The wide hammered torq is one of our most popular torq bangles, elegant, stylish and it looks fabulous on! This is a beautiful chunky silver torque and it will enhance your look beautifully! Our Alana Cuff is one of our most popular cuff bangles and its easy to see why.....it looks stunning on. 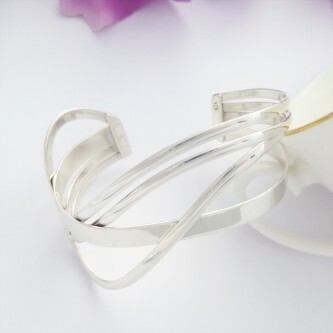 The beautiful Bruna is a lovely 925 sterling silver open cuff bangle and is proving to be a popular choice! Willow is an elegant torque in sterling silver with a pretty, contemporary design. 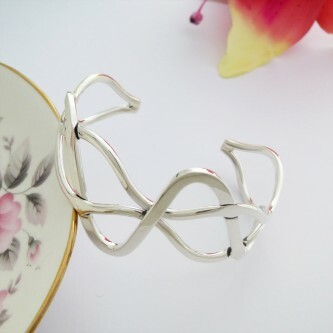 A lovely crinkled effect silver cuff. The perfect cuff to complete you fabulous look! Erin is a beautiful open cuff which intricately weaves strands of sterling silver together, creating a fabulous cuff. Katie is a gorgeous, hammered cuff bangle which is becoming increasingly popular. A stunning 925 sterling silver cuff! Zara is a delightful 925 sterling silver cuff bangle that looks, sophisticated, chic and fabulous on! The Guilty torque and cuff collection is here, featuring a superb range of designs from the classic traditional torque to a collection of gorgeous cuff designs that are modern, classic and stylish. Our range includes solid handmade torques and best selling cuff designs such as the Alana, Bruna, Chunky and Hammered Cuffs. All of the cuff bracelets and torque bangles from Guilty are hallmarked 925 sterling silver, all come with Free delivery and bespoke bangle boxes designed to keep your jewellery in prefect condition. Guilty has a great range of bangles in a cuff and torque design made from 925 sterling silver including a whole new range of solid torques and cuffs, all are hallmarked in the UK. Our women's bangles for cuffs and torques are one of our most popular ranges and provide an elegant solution as they are really easy to get on and off your wrist. This makes our torc bangles a perfect choice for those that like to wear bangles on a day to day basis. The sterling silver cuffs and torques are also incredibly popular, they are great for evening wear and for those that want a wider bangle that is easy to put on with stunning and sophisticated designs that make a perfect present and are ideal for dressing up for a big night out. The Guilty cuffs and torques collection is designed to offer something for everyone. Many of our Guilty torques and cuff bangles are made exclusively for us by specific designers that create handmade torq bangles in the UK and all of our torques and cuffs for women are hallmarked at a UK assay office. Why Choose a Torque or Cuff? Many lades and indeed men prefer the fit of a torque or cuff over a solid bangle or loose bracelet, below is a list of some of the benefits that this style of bangle has to offer. Guilty has a great range of cuffs and torq bangles with a range of modern designs, perfect for ladies that love to dress up. Open ended style is more comfortable. Torques and cuffs are easier to slip on and off for some people with larger wrists. Cuff bangles tend to be more fashion forward and a lot wider than standard bangles. 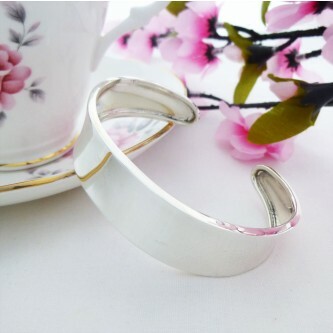 Cuffs have a flatter and thinner silver design.